The char siu bao is a dimsum staple. Sweet, juicy bits of Chinese bbq pork oozing out of the soft, sweet bun. The secret to creating that char siu bao taste is to use dried onions (McCormicks). Please look up the Basic Yeast Dough for Steamed Buns that accompanies this recipe. For the Basic Yeast Dough Recipe, see Useful Link below. Prepare the dough: Make 1 recipe of Basic Yeast Dough for Steamed Buns. Make sure you cover the finished dough with a damp tea cloth. Preparing the filling: Mix all the sauce ingredients (oyster sauce, hoisin, soy, sesame oil, wine, sugar, cornstarch and water) together in a bowl. Heat the oil in a saucepan. Add all the sauce mixture into the pan. Stir. Add the diced pork to the saucepan. Cook on low until the sauce glazes the pork. Add the reconstituted dried onion and sesame seeds and toss together to mix. Let the filling cool before proceeding. Folding the bao: Take a dough portion, work into a round ball about 1 inch in diameter. Flatten it into a 4-inch round with a rolling pin about Â¼ inch thick. Make sure the edges are half as thin as the center. Place 1 heaping Tablespoon of filling into dough. Pull the sides to meet at the center, making a ruffled fold as you work. Pinch the top together and give it a twist to seal. Pinch off any extra dough at the top. Place onto a piece of waxed paper. 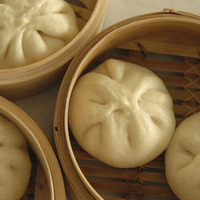 Place buns in steamer about 2 inches apart and cover with a damp cloth. Allow buns to rise in a draft-free place for about 20 minutes. Place steamer over the simmering water for 15 minutes, or until bun is well risen. Add water if necessary so that wok is not dried out. Made these - wonderful! I did make one mistake with the Chinese Rice Wine. Make sure you boil some of this off when cooking - I had the flame too low and it left the too strong a taste of the wine. Will definitely make again. My favorite dim sum dish. The dough is not dry at all, and the pork stuffing is AMAZAING! This is great. My own recipe was with crab and pork. Linda, I have to tell you that I saved this recipe some months ago, trying to find the time to make the buns. Luckily, I finally got to make the filling tonight, and will finish them off in the morning. So...long story long, lol...the filling is to die for! I used to buy these at the grocery store, but more and more often, had found them to be too full of gristle and once even found a shard of bone. That turned me right off, even though I still craved them. Thank you so much for sharing this recipe, and enabling my cravings! By the way, this filling is much better tasting the store bought. These look so delicious, but I don't have a steamer. Is there another way to steam them or do I need to go buy a steamer? This is like our version of Siopao. It looks good too. The best meat marinade in the world!..... will leave a fillet steak standing! Haven't tried this one yet but have made one in my colletion,,, The absolute BEST!!!!!! I have always been fascinated with the appearance of these little guys. The recipe sounds amazing and I can't wait to try it! !